For your important pH calibration and measurement we offer a wide range of ready-to-use pH Buffers from a number of leading suppliers. These come in a variety of pack sizes, clear or colour coded solutions, and all have either NIST or ISO Guide 34 certification. 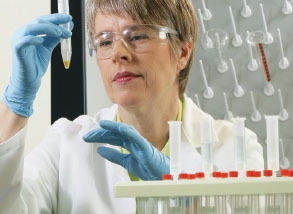 Ajax Finechem Labchem products are reagent quality chemicals suitable for general laboratory work, and include both clear and colour coded easy-to-use pH buffer solutions for the calibration of pH meters. LabServ Pronalys offers quality and reliable buffer solutions — available in clear and colour coded solutions. All are traceable to NIST and available in a range of volumes and pack sizes. SPEX CertiPrep now offer Certified pH Buffers from pH 2.0 through pH 10.0, packaged conveniently in 500 mL bottles. The buffers, certified to ISO Guide 34 and ISO 17025 requirements, ensure you receive nothing but the highest quality products available.